I never would have thought that I’d be featuring Weird Al Yankovic in one of my blog posts, but this week I couldn’t help but smile after seeing his new video, “Word Crimes.” A parody of Robin Thicke’s “Blurred Lines,” the three-minute video has already wracked up close to 4 million views in the two days since it debuted on YouTube. The only thing better than the resurgence of Mr. Yankovic (and resurgence is a fair word given that a second new video of his entitled “Tacky” also dropped this week) is the fact that he created a song that should leave content marketers like me swooning with appreciation. Why? Well, since using language and grammar properly is something that seems to be falling out of favor with so many people (perhaps they’re too busy honing their use of emoji, hashtags, and acronyms instead), it’s nice to see a little attention paid to them, even if it’s in Mr. Yankovic’s usual tongue in cheek style. The reality is that our use of language is a reflection of who we are and, when we do so carelessly, it can make a bad impression. That’s not to say that you should compromise your style for the sake of adhering to every single grammatical rule (certainly creating engaging, conversational writing often requires some bending of the rules), but it does mean that you need to understand which rules can stand to be bent and which cannot. I recently saw one content marketing blogger advise her readers to “write the way you talk,” which I think is a dangerous approach. After all, have you ever paid attention to how most people actually speak? Yes, you often want your content to be conversational, but the beauty of writing is that you get to be a lot more deliberate about how you express yourself than when you speak. If most of us actually wrote the way we spoke, it wouldn’t be pretty. I had a teacher who once offered some contrarian advice that I think’s spot on: “don’t say everything that you think, and don’t write everything that you say.” In other words, we need to filter and refine our messages before we release them into the world. That’s particularly true when they are written and can be scrutinized long after they’ve been published. While “Word Crimes” may be little more than an amusing distraction for most people, perhaps for some it’s a casual but much needed reminder of the importance of paying attention to the language so many of us take for granted. Well done, Weird Al. Well done. If I were able to like this one million times, I would. 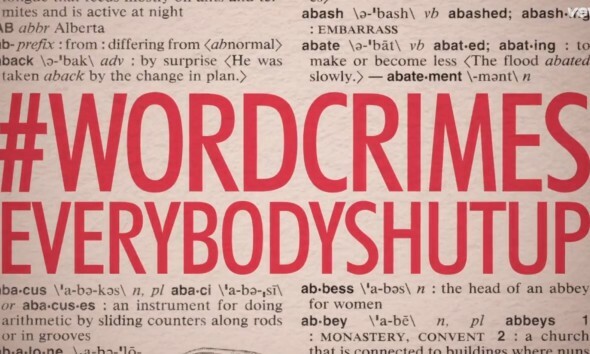 I absolutely cannot stand word crimes. Who here hates “prolly”? I had a hard time typing that. The thought of it gives me a headache. It’s like nails down a chalkboard to me. Don’t be so lazy you can’t finish what is a normal sized word and for the love of God, do not write it. Ever. Okay. I’m done ranting. Thanks for posting this. This article had me laughing, Kevin. Weird Al is hard enough to swallow. And it’s pretty nerve racking, as a marketer, to see people abuse the language! Great post, thanks!